Mel Stottlemyre was born on Thursday, November 13, 1941, in Hazleton, Missouri. 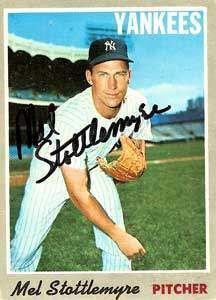 Stottlemyre was 22 years old when he broke into the big leagues on August 12, 1964, with the New York Yankees. His biographical data, year-by-year hitting stats, fielding stats, pitching stats (where applicable), career totals, uniform numbers, salary data and miscellaneous items-of-interest are presented by Baseball Almanac on this comprehensive Mel Stottlemyre baseball stats page. 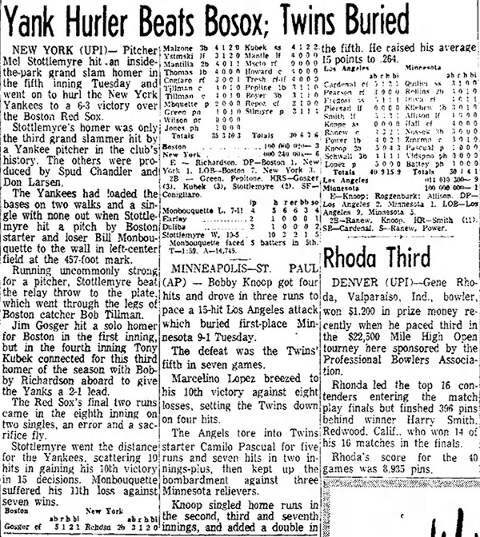 On July 20, 1965 , Mel Stottlemyre came to the plate, it was the bottom of the fifth inning, the bases were loaded ( Joe Pepitone on third, Clete Boyer on second, Roger Repoz on first), and Mel hit an inside-the-park grand slam off Bill Monbouquette . No Yankee pitcher, since Stottlemyre, has ever hit an inside the park slam. Did you know that Mel Stottlemyre is one of only three pitchers in New York Yankees ' history who have thrown forty-or-more career shutouts wearing pinstripes? Did you know the other two, Red Ruffing (40 shutouts) and Whitey Ford (45 shutouts) are both hall of famers ? Did you know that several Major League fathers have had two (or more) sons make it to the major leagues, but Mel Stottlemyre is the only pitcher who had two sons, Todd Stottlemyre and Mel Stottlemyre (Jr.), who also became big league pitchers? The Yankees had four 20-game winners during the 1960s; Ralph Terry (23-12 in 1962 ), Jim Bouton (21-7 in 1963 ), Whitey Ford (25-4 in 1961 & 24-7 in 1963 ), and Mel Stottlemyre, who had the most twenty-win seasons for the Bronx Bombers across the entire decade (20-9 in 1965 , 21-12 in 1968 and 20-14 in 1969 ).